Since Trump was elected, even before he was inaugurated, there has been a group of people from the Deep State and the Shadow Government who've been out to depose him. Some are known to us, Comey, Brennan and Clapper. Others have remained behind the scene avoiding scrutiny and attempting to further their nefarious plots. Is Trump going to strike back and put an end to this treasonous activity once and for all? It certainly appears to be the case. Let's see what happens next. As Doug Casey sits back and watches from South America, the fight is on. China continues to rise and America keeps on it downward path. He fears that the US will try something militarily because it's the only part of the government that's working and it's still superior to China's armed forces. Unfortunately this is the price we pay for unlimited government. 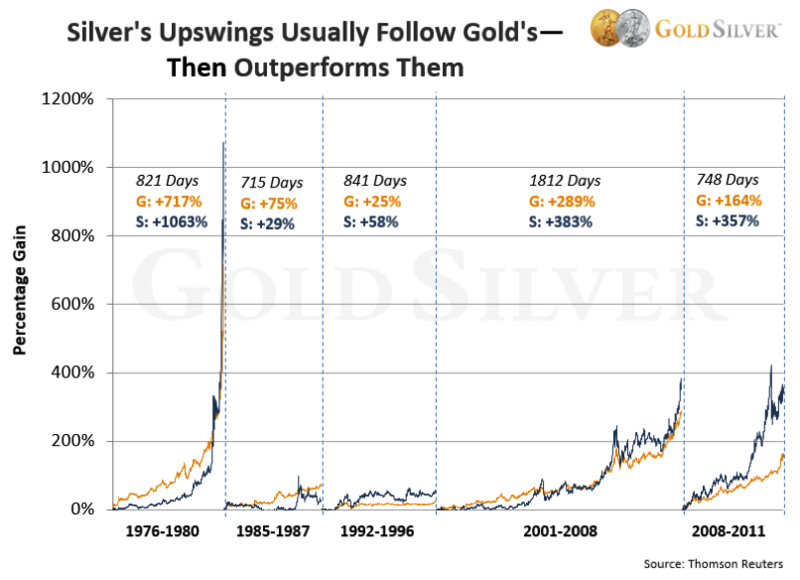 It's no secret that the precious metals markets have been in a decline since 2011. While they stabilized in 2016, they basically did nothing in 2017. 2018 looked like it was off to a healthy start, but has subsequently gone back into a trendless channel. What's going to change that? A black swan, the inevitability of self-destructive monetary policy or a realization that things must change. No one knows the answer, only that everything changes and nothing ever stays the same. Figure nothing more will happen to these markets until Q3 at the earliest. So sit back and watch the paint dry. It will be more amusing. When we left off last week, we portrayed an economy that was starting to run out of steam. It appears that there's a waive of retirees just waiting to overrun Social Security and Medicare. John believes that the government will simply inflate its way out of the mess and hope for the best. But will it work? And let's not forget the other silver tsunami, namely the shiny metal kind. It's been trading sideways for so long that there's little investor interest left. At some point that's going to change and change big. We know we've been saying it for years, but it's true. The most important thing in life is to be a free thinker, a critical thinker, capable of detaching from the masses and arriving at your own well thought-out conclusions and opinions. It is the only true path to fulfillment and satisfaction in life. Unfortunately, all too few of us ever attempt it. It's got zero to do with left/right, it's all about your ability to deconstruct stories and figure out who's trying to control your mind. The inability to engage in independent thought is a sure pathway to mental slavery. Remember 1984 and the thought police. Every government seeks to control its subjects' beliefs and wishes. It's how they get their power and keep it. Finally, people are opting for the Red Pill and freedom. It can't happen fast enough! Rick Ackerman joined us today for a quick look at the market and the economy. Rick says that the only stock you need to watch is Amazon. It's holdings are vast and its impact upon the New Economy is great. The market could be telling us the stock and therefore the economy are on their way down. He thinks that when it finally comes down it could go from $1400 to $200, when the eventual economic downturn eventually hits. Interest rates have definitely turned negative and will probably become more so in the near future. And watch out for declining state economies and public pension funds. That crisis is coming soon. Very soon. But Rick doesn't see much in the near future for precious metals. But let's see what happens next! The 10 Year Treasury has broken the crucial 3% rate level and now no one knows where it will stop. What affect is this going to have on the real economy. Oil is getting closer to $70 the barrel. This could also have a major economic impact too. Can the market resume it's bullish pace based on these factors? Let's see what happens next! Wayne Allyn Root is on a roll. He's become a common fixture in living rooms all over America. He believes that Trump should have fired Mueller long ago, as well as all the Deep State holdovers. They're doing nothing good, simply blocking Trump's Agenda. But the truth will eventually come out. Big changes are in store. Get ready now! Think back to the late 1980's when the plague of securitization started. It became a way to turn liabilities into assets. But not really. Would the housing bubble have blown up the way it had? Would auto, student and credit card bubbles have been blown up to the extent they are currently? Probably not. We also talk about internet privacy and speech. It's all part of the same puzzle. When David began the project of describing this movement in the 1980s, the emergence of the left as a mainstream force in Amer­ica’s political life was fairly recent and inadequately understood. Conservatives in particular often failed to appreciate the anti-American animus of the left and its apocalyptic goals. At the same time, conservatives imprudently accepted the left’s deceptive claims to be “liberal” and “progressive,” ascribing to it idealistic intentions that masked its malignant designs. The contents of these volumes were conceived as a corrective to these false and disarming impressions. This is the ninth and final volume of my writings about progressivism, a movement whose goals are the destruc­tion of America’s social contract at home and the defeat of American power abroad. The Democrats have done the unthinkable, they're suing Trump, Russia and Wikileaks. What are they thinking? They're opening up Pandora's Box. They'll be subject to discovery and all sorts of embarrassing disclosures. And what about Seth Rich and the Awan Brothers? Q anon seems to imply that Deputy Attorney General Rod Rosenstein is in trouble. Then there's Uranium 1 and so many other Obama scandals just waiting to see sunlight. John and I have been talking for years about the coming pension crisis. And now it's almost here. 100's maybe even 1000's of government entities are in trouble.They won't be able to meet their bloated pension commitments. This will increasingly lead to municipal bankruptcies. Right now states cannot file for bankruptcy, but no doubt Congress will soon change the law. Get ready! Mark Zuckerberg is like the state of California. Brilliant, young, reckless, self-destructive and much more. California is on a death spiral and yet so many incredible companies are crushing it. It's a real conflict. What will it take to change course? Can Trump do it? Is it even possible? Chris Vermeulen is one of the most savvy traders around. Right now he's just waiting for something to happen with gold and silver. All the experts could very well be wrong, silver might actually lead. And if it does, this next precious metals bull market phase could far out perform even the most optimistic supporters. But as we know the future is always uncertain, so don't put all your eggs in one basket. In the middle of March, The Guardian, a British lefty tabloid, rolled out a fake scandal that has dominated the media. Its original article claimed that Christopher Wylie, a "whistleblower", had revealed how Cambridge Analytica, the company he had worked for, had helped Trump win by illegitimately harvesting large amounts of Facebook data and then exploiting it to target users. The story has since fallen apart in every conceivable way that a story is capable of falling apart. Obama’s people had also harvested data from Facebook friends. "We ingested the entire U.S. social graph," his media analytics guru had boasted. But so had everyone else. A platform operations manager at Facebook estimated that hundreds of thousands of developers had gotten access to friend data. So much for The Guardian’s claim that, "information had been harvested on an unprecedented scale". It's all just a big excuse to silence the right on social media and get rid of Trump. Good luck! There's a retirement crisis that's about to hit the country. Whether you're a retired/retiring government worker, a social security recipient or perhaps a millennial who's expected to pay for it all, it cannot be escaped. Right now, we're content to kick the can down the road, but the day of reckoning will soon be upon us. Prof. Kotlikoff has a number of tools to help you avoid this fate. He talks about a few of them with us today.